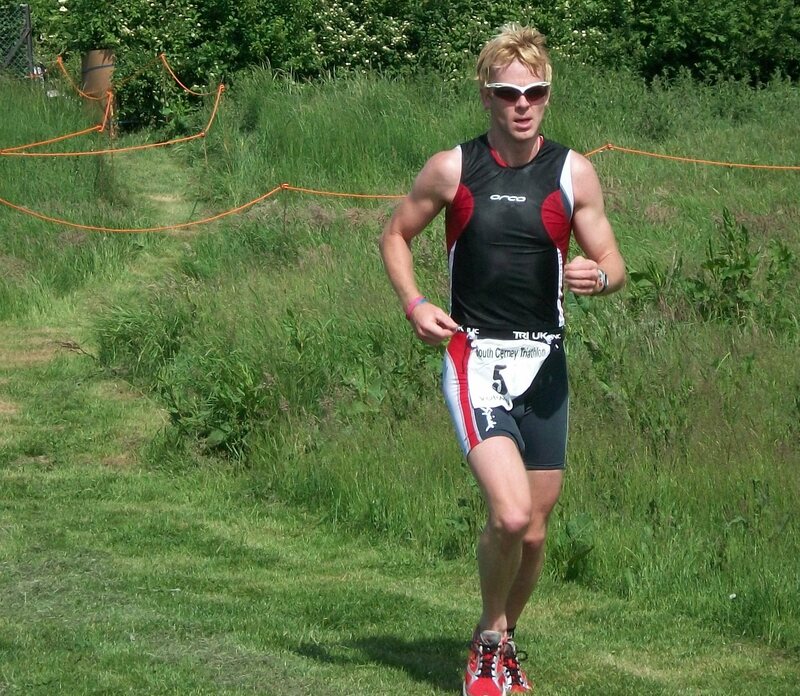 4 weeks since the Merchant Taylor’s win and my last chance to race a triathlon before making preparations for Ironman Germany (more in another blog). Whether or not my Ironman fitness over the past 12 months has improved only time will tell, but my attitude certainly has. I put a lot of pressure on myself these days to get a decent result. As I headed bleary-eyed (another 3:30am alarm and 1hr30 drive) with Yve to registration she asked where I’d like to finish, and I believe I said “..top3 would be adequate” ha! It’s very easy to get disappointed these days but then at the same time it’s important to keep thinking big and pushing on. I’ve always been a competitive athlete particularly with myself. I try to improve over previous years in all departments. I’m fully aware at 36 years old that this will not last forever and I’m giving myself this season and the next before I move focus to something else, and perhaps take a break from competitive Ironman triathlon. Back to the race! I didn’t attach any puncture repair equipment to the bike this time having realised the sealant was useless for anything more than a slow puncture/small hole (thankfully I realised this in training and will always have a spare tire in selected future races). I attached a small 500ml bottle of light (4%) electrolytes to the frame again, but will probably go without liquid for future olympic-distance races. I always ensure I’m hydrated in the 24hrs preceding any race and I’m sure a few secs would have been gained from aerodynamics. Speaking of aero, I tried the the new bar pads in the tight positioning and just about got through the ride ok. I’m not sure how I’d feel after 5hrs in the saddle so will have another tester on Richmond Park (once the 10-day resurfacing has finished – bad luck on the timing!). No other changes to the bike. Unfortunately the saddle came a bit loose but didn’t pose a huge problem. The VO2 Classic Triathlon had three wave starts – 7:30/8:00/8:30am. I decided to go for the 8:00am start. I thought the 8:30am start might mean a little more road traffic including the overtaking of earlier competitors on bike and run. I think I made the right decision. After registration and racking the bike I took a short run along the run course to check the surface and watch the wave1 start. A challenging xc-style run over grass and uneven ground to take the zipp out of your running. With a bike course that was 3km over the standard olympic distance and the off-road run, I was again going to miss out on a decent olympic-distance PB. There will be another day. Wave1 was small (30max), but wave2 and 3 both had around 100 starters. After the pre-race brief and a warm-up I lined up alongside a few others (inc two ladies from Bath Amphibians who posted 20min times) at the front. I decided I’d go hard again from the gun, as it seemed to work at Merchant-T. Yve told me after that 2-3 had gone clear and I was in a chasing group of 3, although at the time I could only see one swimmer going clear and I latched on to the feet of another immediately in front of me. This swimmer was going at a hard pace, and one I wouldn’t have been able to handle had I not been in his wake. It was hard work trying to hold-on and I’d occasionally incorporate some hard drills and fast arms to make any lost ground. 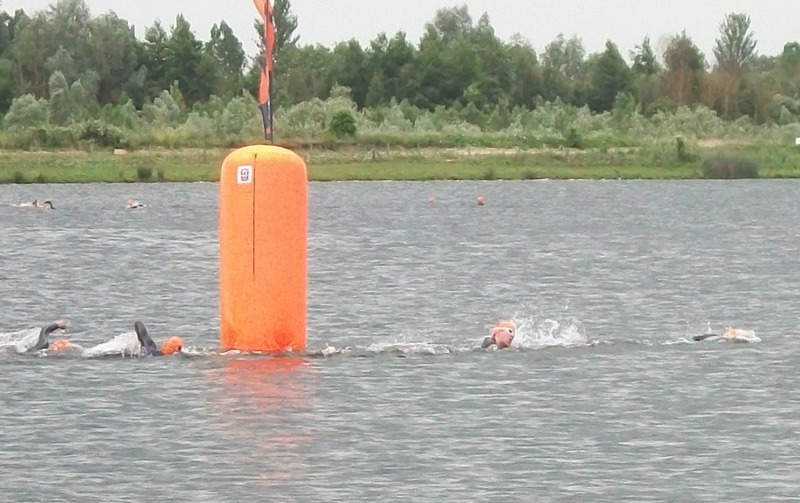 The swim was 2 x laps around buoys and I was doing a good job of turning, but at one point I got into a battle with another swimmer for the feet in front. I lost some ground on them both and would have to take the buoys nice and tight to try and close-in. Unfortunately I couldn’t reach them and they made a few secs on me before climbing out of the lake. 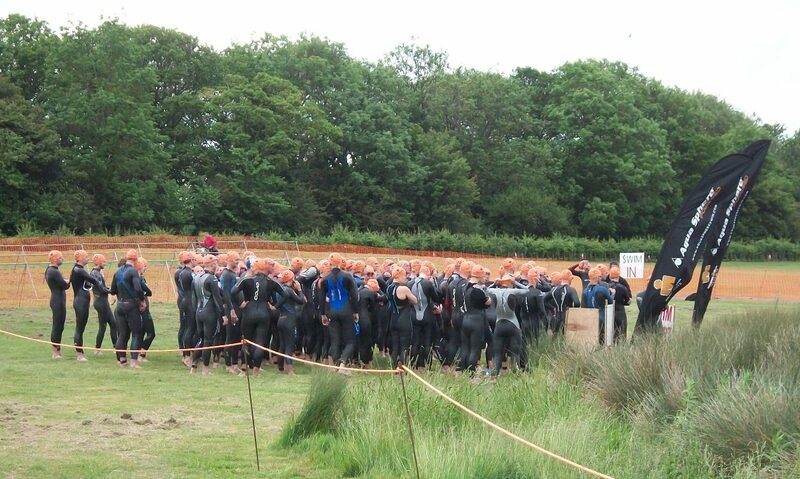 Overall I was really pleased with the swim. The 21:27 split included a short run into T1 and was almost 1min quicker than the PB I did at Merchant-T last month. I’m confident I can hold a pace just off this at IM, so 55-56mins should be possible. I’d forgotten to fill the wetsuit with water on exit and again had to sit down beside the bike to remove the wetsuit from the legs. Lost 30secs here. The mount line was difficult being on a stony corner and the 300m track out to the main road was also covered in grit and very bumpy. I was listening out for the inevitable hiss of a puncture, but thankfully made it to the main road. Still not completely happy with the feel of the Ceepo compared to the Argon, particularly the lack of responsiveness. It’s a bit too smooth a ride, which means you don’t get a feel for the speed and can be a little lazy inc cornering. There were 3 sharp corners and 2 roundabouts on the course and I was terrible on all of them! At one point I went so wide I ended up on the grass verge. 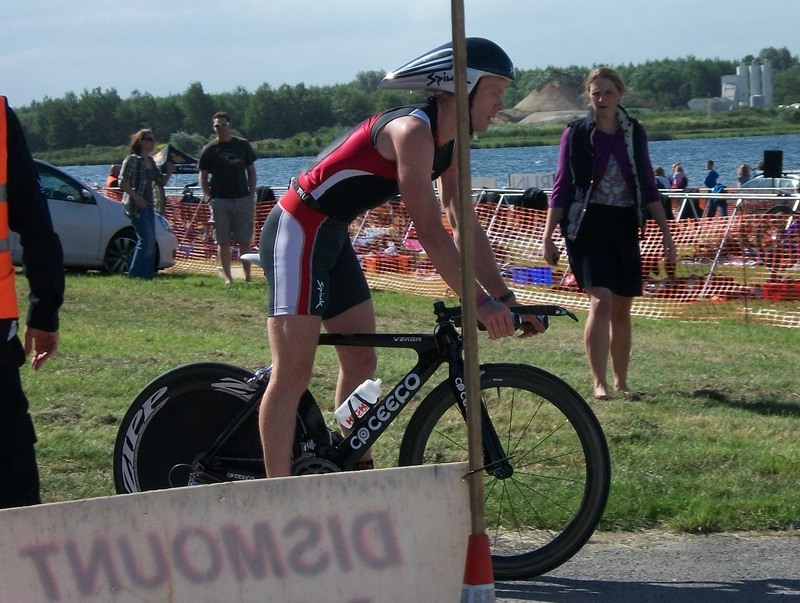 Bit of a lonely bike once I’d overtaken around three of the swimmers who’d exited before me. I’d overtaken all but one in my wave (Michael Milstead) who’d ended up being the eventual winner. I was overtaken by one cyclist about halfway into the bike and worked hard to keep him in my sights for the rest of the course, no thanks to the cornering. He ended up with the fastest bike split on 1:07:31, while I had 4th. Not bad overall. What can I say – 3secs quicker than anyone else….there must have been vapour trails! In a reverse to Merchant-T, my only disappointment this time around was the run. After a great T2 and solid start I soon caught and overtook the bike speed-king (who mentioned as I went past that he “can’t run”) and settled down to a comfortable pace. This was probably my undoing because just like the bike I need pacing to bike and run to my optimum. With a three wave race and an xcountry style run of three out and back laps I had no idea what my position was and who was ahead of me. I could see some decent runners out there but it’s hard to tell where they are in the race and/or how fast they are running. I spotted who I thought might be ahead of me and leading the wave. Unfortunately he was still 2-3mins ahead and not letting-up. I was never out of breath and probably ran at about 80% effort. My time (37:20) was 5th fastest. I noticed later (on The Power of 10) that the Team Feat guys who posted the fastest splits (35:30 and 35:55) are both as quick as me in 10km road running terms. Overall not a bad effort and result. If I’d been offered 1st and 3rd in the two olympic warm-up races before Ironman Germany I would have taken it. It’s also great to make some mistakes now and learn from them, iron them out. I can moan about not getting stuck-in and racing at optimum pace but then in Ironman races you don’t have to worry about that so much, its more about containing yourself, concentrating on efficiency and form and getting the nutrition right. tut tut, last minute new shoes are not a good idea!!! Thanks Sue, you’ve been a great bud over the years, really appreciate your words. Holy cow – 28 second T2! Interesting about the Ceepo vs. the Argon; is it a matter of getting used to the Ceepo? Which bike are you faster on? Iain, It will take a little getting used to on a technical level – cornering and hills. I wouldnt want to race it at IM France or Lanza. It feels sluggish compared to the Argon, which is much more reponsive and quick off the mark. I’m putting this down to the size of the Ceepo – a lot more of it. Once up to speed I’m hoping it will come into its own and the aerodynamics will have an effect. Hoping IM Germany will have plenty of flats. I may use the Argon for IM UK.